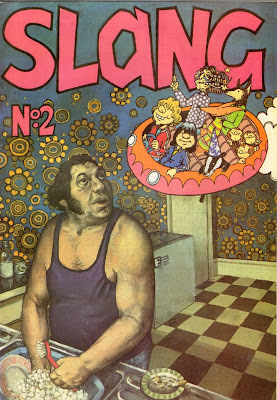 My cover for SLANG No.2. The kitchen sink scene painted on a canvas the cartoon characters and logo drawn on paper and glued on. This was the days before computers! This may be a form of career suicide putting up artwork from 21 years ago, but here goes. 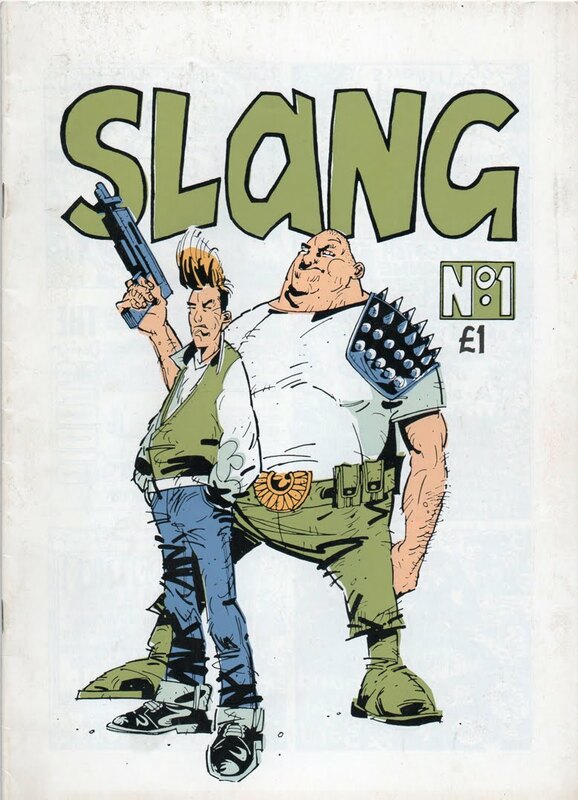 SLANG is where it all began for me and my compadre Sean Longroft, we finally published our own comic after talking about it since we were kids. When we were kids we would have imagined our own comic as something full of sci fi guns and robots and all that gubbins; what we actually published reflected more about out lives as 20 yr olds and the only remnant of Sci Fi featured on the cover to Issue 1. 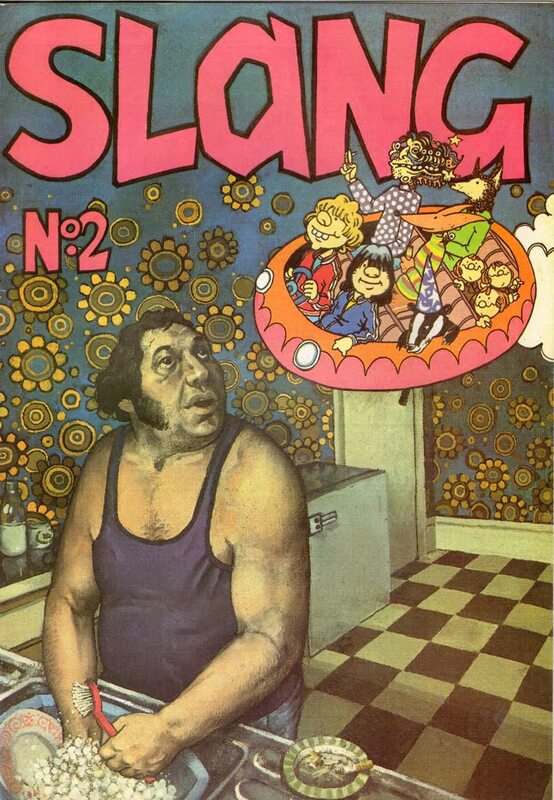 There were no adventure or Sci Fi stories in Slang just the emotional outpourings of two drug-addled young men. We got this cover screen printed at the printers where were doing our Employment Training in Boscombe. I rather enjoyed mixing up the colours, but as you can see screen printing isn't the easiest way of putting colours on a comic book cover. One furious reader in Oxford returned his copy of No.1 to Comics Showcase on the grounds that there was nothing like the 2000ad-ish stuff on the cover inside. There wasn't. The whole thing was an LSD-drenched journey through mundane suburbia. 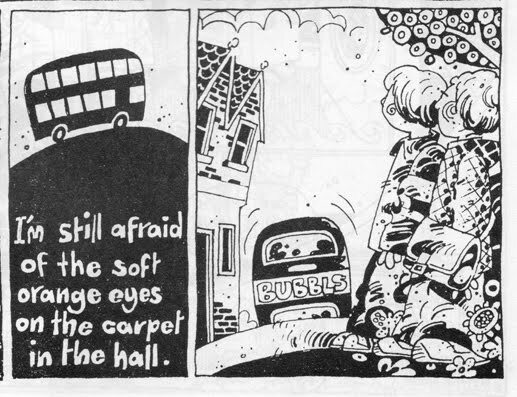 Derek was a proper 'does what is says on the tin' style comic character. Most of what we did was heavily autobiographical (I mean, christ! my Dad was our cover star!). Issue 2 featured my musings on my errant teens and my parents collapse into mutual, general and self destruction. 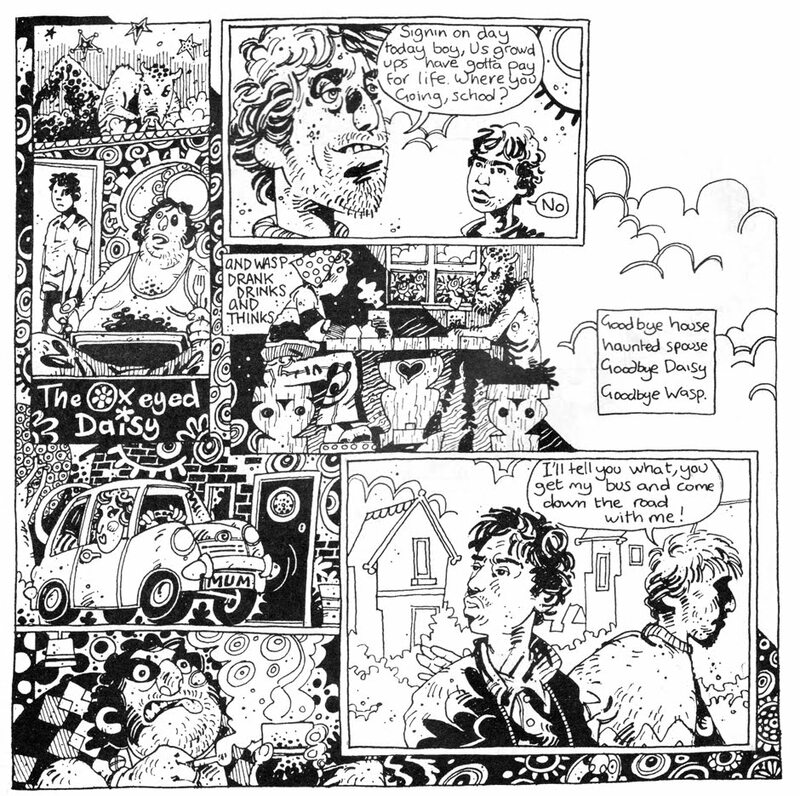 The whole thing was filtered through a psychedelic looking glass and was completely incomprehensible to most readers. Our protagonist is haunted by the place that used to be home. Dad in his pants in the garden at night. Again a sense of being haunted by home. 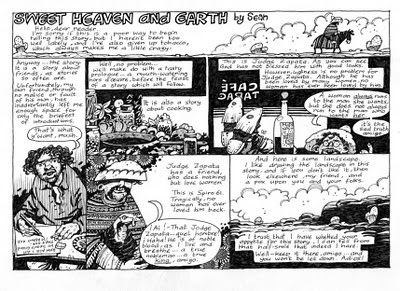 We had no idea what to do with it once we'd printed it (we printed 1000 copies of Issue 2), we weren't really aware of other independent comics at the time and didn't have a clue about distribution. We managed to part fund it by hand drawing advertisments for local record shops, comic shops and head shops. Copies found their way to the strangest places, some even made it to the US. A friend of mine took copies over and gave them to a comic shop, he asked the the shop owner if there was anything like it in the states that they could give him in exchange and he was given a copy of Eightball issue 5. Needless to say we were blown away by it. We ran out of money before we could print more than a couple of copies of Issue 3 (I'll stick a couple of pieces from that up at some point). One of the few decent things the Tories ever did was the Enterprise Allowance Scheme which enabled us to get the first two issues out, when that came to an end we were back on the dole. 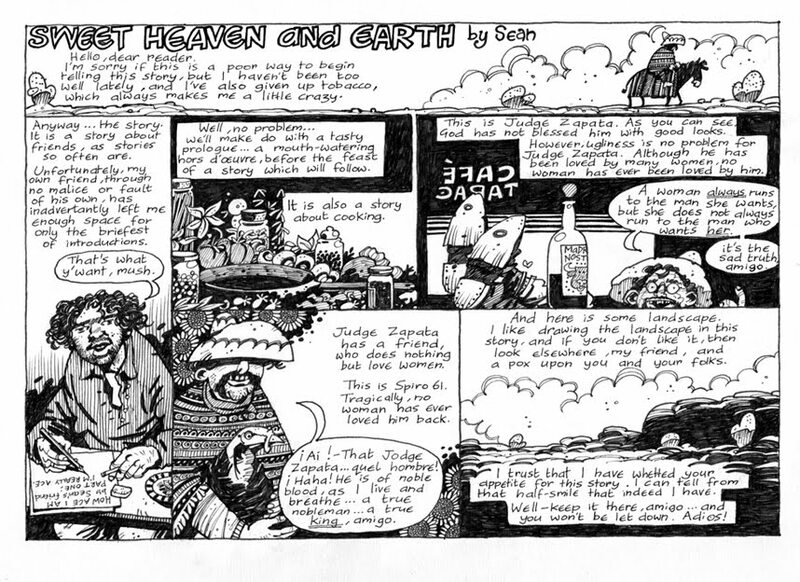 Until, that is, Stuart Green and Frank Plowright got a copy and offered us work on their new football comic Glory Glory. Finally here's a delightful little strip from issue 2 by Sean, he'll hate me for putting this up but he is taking this piss out of me in it. Actually Sean's drawing is much more together than mine. Like I said career suicide, I'm not even the best artist in the thing! Hah! I remember taking copies of No. 2 off you in Comic Showcase in Neal Street all those years ago. I've still got it somewhere in my archives! Really great stuff. i tried flogging my copies on ebay a few years ago..no joy! I grew up in the 70's so easy to push my buttons. 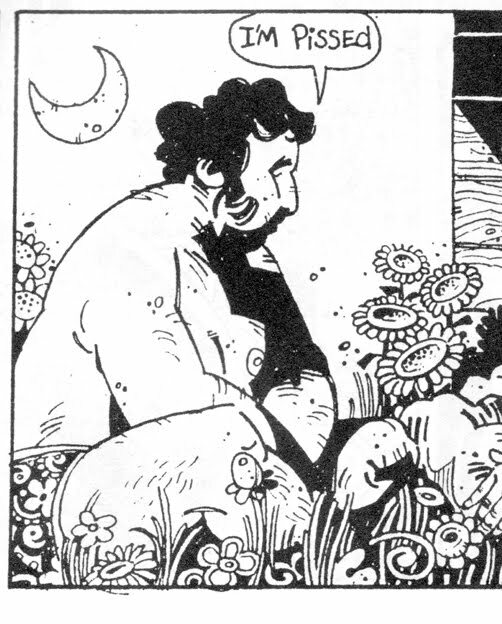 Sounds like my kind of comic. Do you have a set available?